I have only one chart to show you tonight which I call the �History Chart of the End of the World,� which I built out in 2013. I usually show this chart a couple of times a year just to keep the big picture in perspective. 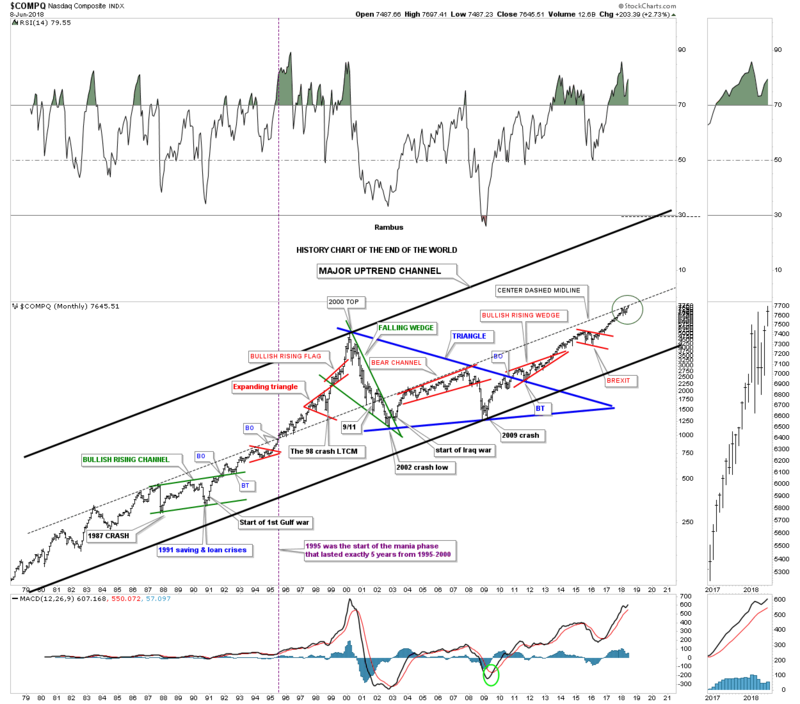 This long term monthly chart shows all the earth shattering events that felt like the end of the world when they occurred and I can personally attest to that fact because I was in the markets in each one of those events. So from a Chartology perspective that center dashed midline carries a lot of weight because of all the touches it has. As you know the stock markets have been correcting since January of this year, about six months or so. The reason I�m showing you this chart tonight is because of the price action over the last six months as shown by the green circle. I�ve explained to you many times how an important trendline can be broken, first with the initial hit and small selloff and then a rally that breaks out above that important trendline and then one final backtest from above to finish off the breaking out and backtesting process. Note the price action on the thumbnail on the right sidebar, especially the last six monthly bars. Now look at the price action inside the green circle. If I�m correct in the interpretation of the center dashed midline then the COMPQ is in the process of breaking out above that very important trendline. This month is still very young yet, but if we see the price action trading above the center dashed midline come the end of June then part two of the breaking out process will be completed. I would expect the breakout rally to be fairly shallow similar to the initial breakout in 1995 and then the backtesting process to begin from above.